History has taught us that if you get your doctrine wrong ‘the way you go about your military business’ you risk campaign failure. In capability development terms, get your concepts and doctrine wrong and you risk developing imprecise equipment solutions which while not as critical, can make campaigning considerably more difficult. Get those both right and other influences hold sway; how you lead, train for and sustain your operations. CBRN doctrine, however, remains largely untested. The Falklands Campaign of 1982 is an example of mature doctrine: 8000 miles from the home base, an extended sea voyage which allowed limited opportunity to train for an exacting environment and intense combat operations, the loss of the Destroyer HMS Sheffield, the loss of the logistic ship Atlantic Conveyor and with it five of the six Chinook support helicopters, troops without an automatic rifle, equipped with the most dreadful boots for such a harsh environment. There were further losses in surface ships including the spectacular demise of HMS Antelope and the infamous Sir Galahad inferno. Yet the campaign was won because of the way military business was conducted; the greatest threat coming from the Argentine Air Force and Naval Aviation who conducted their business with considerable skill and bravery. It was, in the words of the British Land Force Commander, “a damn close run thing”, but it was over in six weeks. Scott GSReS can be adapted for a wide number of scenarios. Warfighting doctrine that was so well honed during the Cold War saw equally short campaigns rapidly achieve their military objectives during the First Gulf War and again in Iraq in 2003. All was well, providing operations were linear and the enemy wore uniform. If the enemy did not wear uniform, things became a lot more complex in what has been described as a 360o operating environment. The way of conducting business lost its assured footing and within a cauldron of political, cultural and ideological complexity, measuring the extent of military success or failure against an asymmetric adversary became ever more challenging. Against this kaleidoscopic background, it is interesting to track how CBRN Protection has evolved. While the sarin attacks on the Tokyo Underground in 1995 were largely seen in the isolated ‘wacko/crazy’ cult ideology category, they did expose vulnerability in a Security rather than a Defence context. A seismic shift in CBRN threat perception occurred in 2001 following the tragic events of 9/11. In its aftermath came the shock dispersal of anthrax in the United States mail system that lead to the death of 5 of the 17 casualties and indications that anthrax was being developed in Afghanistan by Al Qaida. The carriage of the former information in the global media, the linking of Al Qaida to WMDs, combined with renewed scientific scrutiny of anthrax itself, saw funding pouring into ‘Homeland Security’. Prior to the Tokyo underground incident and 9/11, addressing deliberate CBRN release was largely perceived as a military activity, but organisational changes point to awareness of a heightened CBRN threat. While the US already had a dedicated Chemical Corps, in 1998 the President announced the forming up of CBRN Civil Support Teams, the UK MoD announced the forming up of a CBRN unit, Australia formed a Joint Incident Response Unit a year later, while the Canadians formed a Joint NBC Defence Company as a direct response to the events of 9/11 and its aftermath. Further reorganisations followed. Within a short period after 9/11 the UK Defence CBRN Centre was also hosting training for the Police, Transport Police, Fire and Ambulance Services as the concept of a CBRN ‘Inter-agency Response’ gathered steam in response to incidents in towns and cities. As CBRN knowledge and thinking expanded, the Police moved to their own dedicated National Police CBRN Centre, primarily because the way of doing business in the civil arena differed doctrinally from that of the military arena. In addition to other changes, the notion of escape hoods and modelling of CBRN release in cities began to take root, primarily driven by a doctrine that saw CBRN in an urban context. Scott PATRIOT 5510 for operational performance and operator safety. Given the superiority of Defence doctrine in conducting linear combat operations, our adversaries resorted to asymmetric methods to compensate for limitations in numbers, assets and technology, while Defence academia rushed to determine that the ‘future was urban’, heralding ‘complex operations’, ‘war among the people’ and research to design an urban combat vehicle. Just as the civil emergency services drew from the military experience in CBRN protection, specialist military and civil emergency CBRN operators have now developed greater synergies in how they conduct their business. Meanwhile, the response within Industry was to adapt its equipment solutions to meet both specialist requirements and a policy that placed huge emphasis on risk mitigation and personal protection. Within Scott Safety, we were able to build on the successful experience gained from developing the General Service Respirator (GSR) which we developed for the CBRN generalist operator by working in tandem with the UK MoD Defence Science and Technological Laboratory1. This saw substantial innovation in delivering a truly 21st century respirator with some unique design features such as automatic sweat removal, a dual seal and a world beating protection factor. Other features helped give the operator real confidence in his equipment; not least ease of breathing, a huge improvement in the ability to hydrate and a completely secure canister change procedure. Equipped with that knowledge, we were well placed to respond to the complexity faced by CBRN specialist operators; a complexity that required innovation and favoured multi-functional equipment solutions. 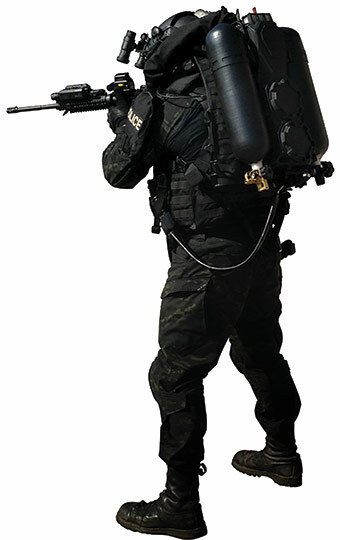 This can be illustrated by two items of equipment in particular: the General Service Respirator evolution Specialist (GSReS) and the Scott Patriot 5510 are both developed with high degrees of multi-functionality to respond to a myriad of scenarios, ranging from counter terrorism, VIP extraction and sensitive site exploitation to release of CBRN material caused by accident, natural disaster, criminality or neglect. Military and Civil Emergency Responders. 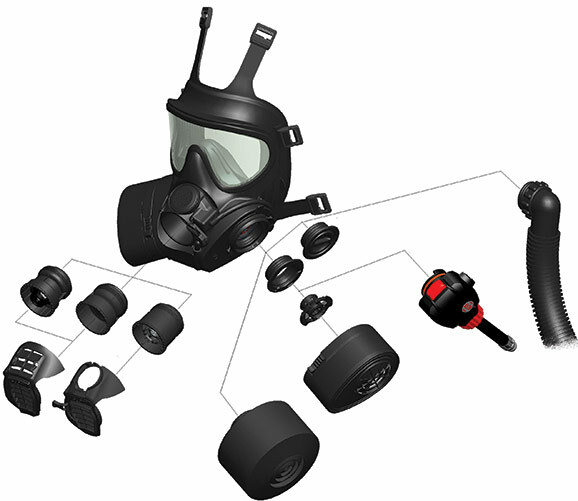 The GSReS is a multi-platform respirator that can be adapted to suit specific scenarios. It can be rapidly changed from twin teardrop canisters to a global standard DIN40 circular canister, one that may be more appropriate to a radiological incident, for instance. 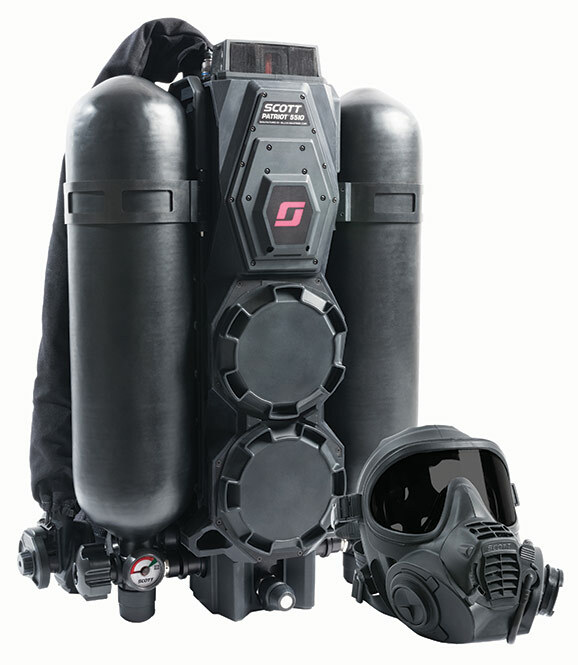 It can be equipped with a DIN40 canister on one side and a demand valve feeding from Self Contained Breathing Apparatus (SCBA) on the other, or be converted to a Powered Air-Purifying Respirator (PAPR). The change from negative to positive pressure can be simply achieved with the addition of a dual purpose exhalation structure and the switch of a lever. One can envisage scenarios, police or military, where the canister is worn from the outer cordon for the move to the periphery of the ‘hot zone’ and then when entering the ‘hot zone’ the operator switches to SCBA to conduct investigative, forensic or sampling work on site. The Scott Patriot 5510 not only epitomizes the use of highly innovative technology to maximise operational performance, it has in-built features that maximize the situational awareness of the team itself, including the command headquarters, as well as the safety of individual operators. Operational performance is enhanced by a multi-functional platform that allows use of multiple breathing options. Wearing the Scott Safety First Responder Respirator (FRR), the SCBA cylinders permit five options (1) use of both cylinders to allow 60 minutes of air (2) carriage of a single 30 minute cylinder if that is all that is required (3) carriage of a single 30 minute cylinder with an additional cylinder for breeching operations (4) using the second cylinder as a surrogate for rescuing a ‘man down’ or a VIP who needs to be extracted through an environment where oxygen is limited, there is excessive smoke, CS or worse and (5) configured without air cylinders. Operational performance is further improved by the ability to integrate CBR detectors and exothermic breaching apparatus into the Scott Patriot 5510 system. Situational awareness is enhanced through android and smartphone technology with encrypted Bluetooth transmission (which can be deactivated for bomb disposal applications) that allows team members and command headquarters to monitor air pressure, system mode, battery levels, individual position (through GPS) and team progress through worst case complex and non-permissive CBRN scenarios. The safety of individual operators is addressed by the ability to monitor biometric performance such as pulse, breathing rate and body temperature and whether the operator is mobile, static, or lying down immobile. Importantly, the system also allows capture and retention of system data. In summary, it provides several options to cater for complex scenarios and uniquely enhances the personal safety of operators. CBRN is the genie that is still in the bottle; albeit the cork continues to be loosened. The IED is the one that got out and has cost millions in blood and treasure. In the same way that personal protection and the vehicle fleet have had to adapt in Iraq and Afghanistan when some very painful lessons were learned, we must be ready to adapt to future CBRN operating environments with multiple and potentially catastrophic incidents. After all, we can hardly claim that our doctrine is mature and tested in this field. Thus Industry has a key role to play in delivering multi-functional solutions for a wide number of scenarios that will also remain relevant while CBRN doctrine evolves and lessons are learned. Scott Safety is driven by technology, innovation and a moral component to enhance both operational performance and safety in the complex, physiologically and psychologically stressful circumstances that will inevitably arise in the future. 1 The Defence Science and Technological Laboratory at Porton Down is part of the United Kingdom Ministry of Defence. Brian Clesham was the former Chief of British Army CBRN from 2006 - 2010 and Chief of Staff of the United Kingdom’s Defence CBRN Centre during its post 9/11 expansion to incorporate training for the Police, Transport Police, Fire and Ambulance services. He was the author and custodian of the Concept of Operations for the UK Joint CBRN Regiment on its formation and has supported both the UK MoD and Foreign & Commonwealth Office in senior NATO and OPCW counter-proliferation forums. He is a graduate of the NATO Defence College.